Have you ever looked at your dog and wondered exactly what he or she could be thinking? NSID’s No More Woof translates basic canine thoughts into words humans can comprehend. If so, then you aren’t alone — a group of Swedish inventors has launched a funding campaign to produce a piece of technology that could one day help dogs better communicate with their humans. The No More Woof, developed by Sweden’s Nordic Society for Invention and Discovery (NSID), is the first gadget that translates animal thoughts into human language. Using existing electroencephalography (EEG) micro computing technology, the No More Woof headset prototype analyzes a dog’s thought patterns, records them, then translates them into human speech you can understand — and hear. 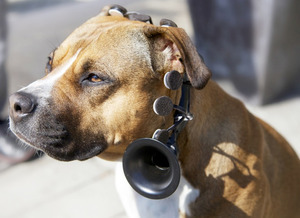 The doggie headset includes a small gramophone-like loudspeaker, allowing Fido to “talk” to you in plain English. If this sounds familiar, then it is — sort of. Remember the talking dogs in the 2009 Pixar film, Up? While the No More Woof isn’t quite as advanced as the device worn by Dug, Alpha, Beta, and the other animated pooches, it is still capable of translating basic canine thoughts into words we can comprehend. NSID explains that while brain waves differ from dog to dog, there are common, more universal patterns they have been able to decipher. “Some of the most easily detected neural patterns are: ‘I’m tired,’ ‘I’m curious who that is’ and ‘I’m excited,” NSID writes on their Indiegogo.com page. Future analysis is sure to yield additional thought patterns, too. And NSID says, once released, the No More Woof will have at least 8 human voices to choose from, meaning you will be able to customize the device to match your four-legged friend’s personality. Since launching their product’s funding campaign, NSID has seen a huge spike in interest in the No More Woof. With over 50 days still to go, the group has managed to raise almost $5,000 more than their initial fundraising goal of $10,000, proving that there really is a market out there for this unusual product. NSID freely admits that, at least at this stage, the No More Woof is only a work in progress. There is plenty to do before pet parents will be able to find the device on store shelves, including additional calibrating and programming that could make the No More Woof the sophisticated canine-human communication gadget NSID knows it will be someday. “To be completely honest, the first version will be quite rudimentary. But hey, the first computer was pretty crappy too,” they explain. Interested in learning more or in contributing to the No More Woof’s development? Check out NoMoreWoof.com or the product’s Indiegogo.com page for more information.